Head over to White Cloud on Facebook and “like” them, then enter your zip code to see if you qualify to print a coupon for a FREE 90-count box of White Cloud facial tissue with the purchase of any White Cloud bath tissue coupon. 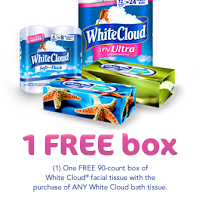 If you do not qualify, you will be able to print a $1 off any one White Cloud Bath Tissue or Paper Towels coupon. White Cloud is only available at Walmart.